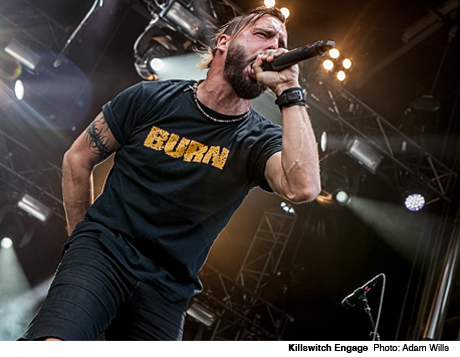 From a classical prelude straight into groove-oriented melodic metalcore, Killswitch Engage kicked off one of the catchiest (and, at times, silliest-looking) performances of Heavy T.O. Lead guitarist and backup vocalist Adam Dutkiewicz worked hard at being the centre of attention and bad taste, leaping and jigging around the stage in short denim cut-offs (despite a knee brace) and delivering sexist humour in the testosterone-drenched voice of a pro-wrestler. In honour of frontman Jesse Leach's return to the band, KSE played not just new songs but a couple of tracks from their debut as well. Then from "My Last Serenade" (off 2002's Alive or Just Breathing), they switched gears to conclude with a Dio tribute, performing "Holy Diver" in their own characteristic style.